There are few things that are likely to occur in your world – or, mine – that could be easily classified as “simple.” It just doesn’t seem to work out that way anymore. Even the “simple” question of how far you go with regard to inspection and testing in my world, the incredible world of broken cars… Or, more appropriately, when you should stop when the process is complicated by the increasingly sophisticated electronic content of the vehicle. It’s hard enough when dealing with issues involving highly evolved systems, but even purely mechanical problems have become increasingly difficult to isolate because of the way vehicles are designed and built today. You can call it “going for the low hanging fruit:” the easiest sale, the most obvious cause or the most simplistic fix, but in all fairness, there is no “This is it!” popup that appears when you’ve finally isolated the problem. When was the last time you kept looking for your keys or that elusive scrap of paper with the phone number you so desperately needed on it after you had it in your hand? When it comes to inspection, testing, analysis and evaluation, you will never know if you went far enough unless you take that extra step. This became increasingly clear last week when we were tasked with isolating an NVH (Noise, Vibration, Harshness) problem on a vehicle that suddenly started “vibrating” in gear. If described carefully enough by the motorist, interpreted properly by the service advisor and recognized by the technician, you’ve got a ‘shot’ at hitting your target. But, ‘harshness’ is a subjective evaluation that requires time, discipline and a high level of cooperation between the person who wants the problem solved and the professional tasked with solving it. Unfortunately, that kind of clarity rarely transcends the physical realities of thousands of miles of wear and the emotion of an unscheduled, unbudgeted visit to the repair shop. In this particular case, a fairly important piece of the puzzle: an illuminated Malfunction Indicator Lamp (Check Engine Lamp); never made it to the service counter. 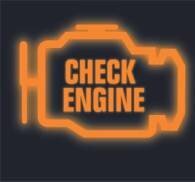 The Diagnostic Trouble Code (DTC) driving the lamp was triggered by a Knock Sensor failure: the sensor’s wiring harness had served as a late night snack for some out-of-town guests – a family of field mice who had taken up residency under the engine’s intake manifold. The vehicle had over a 100,000 miles on it, hadn’t had it’s 90,000 mile service and the intake manifold gaskets were leaking coolant at the corners. Any one of these conditions could have caused the kind of ‘vibration’ or ‘harshness’ the customer was trying so hard to describe. And, yet, after the Intake Manifold had been removed, the Knock Sensor and its harness had been switched and the Intake Manifold Gaskets replaced, our technician wasn’t satisfied he had isolated the root cause of the customer’s concern. We could have made a strong case for cleaning the Throttle Body and performing an Intake De-carbonization Service: both were layered with coke and carbon and long overdue for service. We could have suggested replacing the Spark Plugs. They should have been done long ago. But, instead, our tech drove the vehicle again and again to duplicate the sensation our client was concerned about. He wasn’t satisfied with the ‘easy’ answer and as a result saved our client a certain breakdown and a very costly repair. The Harmonic Balancer – the Crankshaft hub – located at the front of the crankshaft and the bottom of the engine: impossible to see even if you know what you’re looking for or what you’re looking at – was literally coming apart. Continuing to critically look at the customer’s concern for a solution beyond the ‘low hanging fruit’ of some not-so-obvious problems takes discipline, determination and more than a little curiosity – elements that separate great technicians from good technicians and ultimately assures the motorist of a complete solution, a quality repair, an uneventful journey and a safe return home. It’s what happens when you go far enough and far enough gets you to where you both want and need to be.